A comprehensive guide to roofing shingle types. Most Homeowners know how important it is to protect their home with a great roofing system. Choosing the correct roofing shingles to protect it however, can be a tricky and overwhelming decision. While your roofing contractor can certainly help and advise with this choice, its always best if the homeowner takes the time to fully understand their options and make an informed decision. In the text below, we’ve laid out all the information you need to decide on the best shingle type for your home. 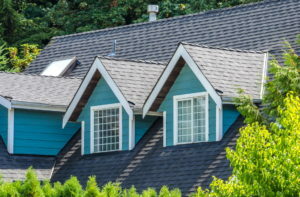 Asphalt shingles are the most commonly used residential roofing material today, and over the years there have been many improvements to further increase both their aesthetics and reliability. 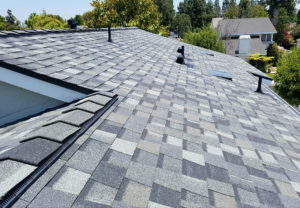 The original base material for asphalt shingles was made of natural fiber rags that did not hold up well to moisture and changing temperatures. This was followed by an upgrade to cellulosic reinforcements using cardboard, recycled paper and wood fibers. Today, fiberglass is the material currently used as a base for asphalt shingles, and this inorganic material is a great improvement offering extreme durability and a long life. Asphalt shingles can be divided into three categories: Three-Tab, Architectural, and Designer. Three-tab is the most economical type of asphalt shingle. 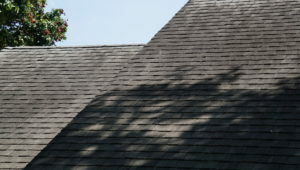 This shingle type can be recognized by the tabbed “cut-outs” along the bottom edge of the shingle that cause them to look like three separate shingles once installed. The idea with the three tabbed approach is to create a nicely textured roof while maintaining ease of installation and manufacturing, thus lowering cost. This means they generally have the lowest price tag of all the roofing shingle types. The downside to three-tab shingles is that they are more susceptible to being damaged by wind, heavy precipitation, or hail. They also tend to not look as good as their architectural cousins. The Owens Corning three tab shingles we carry and install for customers, have a 25 year limited warranty, are ENERGY STAR® rated and will stand up to 60 MPH winds. We also offer three-tab shingles manufactured by GAF, now the number one supplier of commercial and residential roofing shingles in North America. Architectural shingles are an improvement on the three-tabbed approach. Good architectural shingles, like GAF Timberline HD architectural shingles, cost a little more but have a higher wind and hail rating than three-tab shingles. Architectural shingles also have additional layers of asphalt laminated together, and are installed in single solid pieces (without cut-outs). Architectural shingles are the most popular type of shingle with our customers due to their balance between reliability, good looks, and low costs. The most high-end option when it comes to Asphalt shingles, are designer shingles. Designer shingles are technically still architectural shingles, but they have the added appeal of mimicking traditional roofing types such as slate, tile, or wood shake. While designer shingles may look like these other roofing types, they are still much more affordable and typically more reliable. Designer shingles are a great fit for homeowners who want a truly unique look for the exterior of their home and also for historic homes where a regular asphalt roof would look out of place. While not technically a roofing “shingle”, metal roofing has grown greatly in popularity over the past ten years. The original metal roof was ribbed galvanized steel primarily used on the outbuildings of farms. Flat panel seamed steel roofing was also available and it was sometimes painted and used as roofing for homes. The long life and durability of steel roofing was recognized by manufacturers who began offering metal shingles and other styles that were more aesthetically pleasing to homeowners. 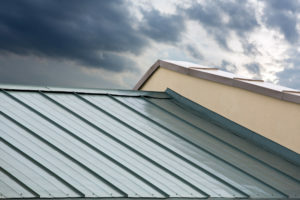 While it is true that the cost of metal roofing is considerably higher than other types of roofing, a metal roof can be expected to perform well for 50 years or more. Need help deciding on a roof shingle type? The team here at Mancilla Roofing & Construction is ready to help you decide on the best shingle type for your desired look and budget. Whether you’re looking for that special and unique look for your home, or just want something affordable to protect it, we’re here to give you honest and sound advice on how to proceed. Reach out to us today to get started.